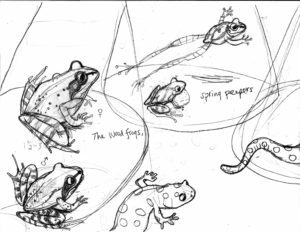 I sketched a double page spread of amphibian species’ portraits. They will be spot lit in pools of light from flashlights. I wanted them to be actual size in relation to each other. 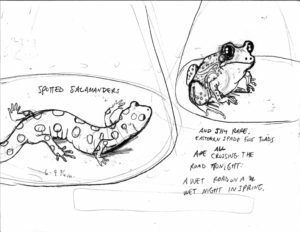 It is getting to be the time of year for amphibian migration. I heard wood frogs quacking in the Fells near the Panther Cave a couple weeks ago, before all this snow. I hope they are okay.